The degree symbols of Aquarius are most useful in elaborating a personal birth chart. You can learn about personal cycles from studying the place of a transiting or progressed planet by degree at a given time, revealing collective as well as personal timings. The Zodiac degrees also act as an oracle. One can open the collection anywhere for a given day, or in reponse to a question. The degrees will reveal what is happening now and if we are attentive and responsive to the cues, what is required of us. Comparing charts of friends and famous people who are known for certain qualities, one can gradually discriminate among the degrees. 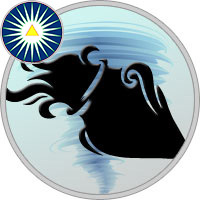 AQUARIUS 1 Degree - A two-headed calf. Taking a good look at things with an eager eye brings you right into the middle of the dilemma of polarities. As you stand there faced with the different sides, you are impartial; neither side pulls you more sharply than the other. Immense opportunity. Huge challenge. You have vital potential for brilliant synthesis, but a subtle temptation to think too long. A schooling in alchemy in every moment - do you find what is ready to emerge or do you think about it? Progressive evolution draws you through all your mistakes into all that can be. AQUARIUS 2 Degree - A woman strolling in a garden. She is unaware that she is being watched by elves. We adopt a split-screen mind when the outward frame of things seems so insistent that we must be reasonable and logical and make complete sense in a quantitative, functional way. But what happens is that the other side of our awareness, the outlawed side, gets very strong in the subconscious and stays alive. We can almost play off of it in emphasizing our skeptical or worldly approach to things. But there is a joke to it. For you are aware of what you are not aware of - you are tuned into the very things you deny. This kind of edge hones the mind and the soul. It teaches invaluable lessons, not the least of which is to make way for the unknown while hugging the known close to you, knowing all the whole how profoundly the unknown beckons. AQUARIUS 3 Degree - A vast ornate Hindu temple depicting hundreds of gods. Living timelessly. Cast loose from the rigors of karma. Given free rein to follow the inner soul, you encounter the vast infinity of worlds which await those who let go. Experimenting with the innovative, the utopian, the fantastic, you are able to spin out magnificently. Investigating and exploring. A consciousness that spreads itself far and free. No one thing more important than another, everything blissfully equal. Possible futures. Staying open. You bear ideals and visions through dark times - nondiscouragable, irrepressible, tireless. Fabulously wealthy with the open possibilities of life. The great open-ended adventure. The known fades, the unknown beckons. AQUARIUS 4 Degree - Many fireflies at dusk. AQUARIUS 5 Degree - Humans worshipping an obese nature goddess. AQUARIUS 6 Degree - A gardener with just one leg. A liability turned into an asset. Something is missing; something else is freed up. Integration, wholeness, balance, coherence are missing. You discover in their place innovation, wild impressionability, and extravagant opening into multiplicity. The life-force runs wild. Consciousness cannot contain it. It is an explosive display of what it is like when the witness is disenfranchised and all the energy goes into the immediate operator. You become totality bursting loose in a particular personal form. This way of being is simultaneously a throwback to idiosyncratic ways of the past, in the vein of eccentricity and being a character, and a first cracking through of new ways framed as spontaneous revelation. You move into any and every kind of awareness-frequency with abandon and with resiliency, to keep juggling, opening, discovering, and discarding with a fervor and a zest and a trace of really knowing that this is the best way to let go of a whole bunch of stuff and open the floodgates for something different to happen here. Something just like it was a long time ago, and just like it will be when the whole world shakes loose a little. AQUARIUS 7 Degree - A woman burning a book of black magic. AQUARIUS 8 Degree - A book, the words in it keep changing. Destiny can keep rearranging itself under special and unusual conditions, where you have written into the contract ahead of time extravagant allowance for major shifts throughout the course of your lifetime. Ready and able to live several lifetimes in one, you are eager to wipe out the traces of a given cycle and start all over again. In love with change and in desperate need of change. Because one side of mind is dogmatically rigid. And so in order to neutralize and outwit your own dry, stuck places, you make sure to generate innovative, radical currents - slowly wearing away the tight self-identity knots and generating freedom where being stuck in old pictures had sealed off the territory and made life predictable and unbearable. AQUARIUS 9 Degree - Violets blooming by the barred windows of a dungeon. The old past-centered facets of life are predominant in this world. Those who take on the thought patterns of this old earth find themselves immensely trapped in time and space, and in physical form most of all. Yet in the very midst of thinking and operating in this rationalistic way, you are subtly and secretly fostering a great wealth of New Earth consciousness, of fresh ways of seeing. By relentlessly exposing yourself to the rigors and consequences of the mentally-based world, you come to that edge where the way to liberation becomes so sharp that the deeper seeing comes up to give you space and breath. It is quite a process to live between cycles, bridge divergent worlds, and feel the necessity of keeping it all going. But truly the soul is witnessing each dangling moment, and preparing to go free when the season is right and the prison doors open of themselves, as the karma is completed and the unknown calls you onward. AQUARIUS 10 Degree - A black raven with a bright red head. A watcher poised, observant, keen. Seeing into souls. Negatively disposed, absolutely alert to what is wrong, to what is missing, to what should be changed. Fabulously mental, with a gargantuan appetite for trouble, for difficulties, for crises. Scavenger, bird of prey. Karmic endowment of a strange kind. Susceptible to the dark. Wandering in a maze. Knowing just where you are but not who you are. Identity is eclipsed by the necessity to be effective in action. You are compelled from within to make yourself useful, to do the dirty work, to get down under. Gravitating toward the impossible, and somewhat blind to the pitfalls of such a way of operating, you ferret out the facts. You serve a poser behind the scenes, and are obedient to a fault. AQUARIUS 11 Degree - Crows eating the corn that a farmer has sown. Giving yourself free rein to negate, to destroy, and to deny. You go with the darkness and wait to see how its cycle extends. While waiting, you can indulge the lower side of your nature to the utmost. The fun lies in getting away with it. Those most skillful and adroit will keep this malice on subconscious levels and will identify consciously with being the victim of such impulses. A complex and confounding internal politics ensues. You must get away with murder while proclaiming your naive. Ingenuous ignorance of anything wrong. However, the rational mind becomes so entangled in the webwork of spy versus spy that sooner or later every inch of territory is eaten away by plots and counterplots, and nobody is left who can tell who did what to whom. For, once you start letting the carrion birds in, very little virtue territory shall remain. AQUARIUS 12 Degree - A heated argument turns into laughter. Tension and release. Contraction and expansion. The breath of the mind resolving its dualities. In order to make it possible for radical truths and significant realizations to come through, you must first karmically dramatize, inside the ego-mind and outside as well, the unbearable tension between opposing points of view. You enter upon disputes, advocate positions, set up heroes and villains. And then when your whole inner and outer world is packed with dilemmas, problems, arguments and battles, you become ready to seek out synthesis, to enter upon a cycle of restoring wholeness. During your experimental years, spice means everything. But during your maturity, there is no further mileage to be had in turning anything against anything else. Getting it that you made it all up in the first place, and that the rational mind delights in controversy but has its limits. When resolution comes, everything looks different. All of life turns around, and most particularly your relation to yourself changes from the critic into the friend and respectful ally of your own inward intentions. AQUARIUS 13 Degree - A lidless granite sarcophagus. It is empty. There is nothing to go back to. The past has become a phantom. You are propelled forward into the great unknown. But it is so easy to become somewhat desperate and out of context. So much depends upon how you interpret the fact that you are strictly on your own without a personal history or heritage to fall back upon. Is this real opportunity or a strange fate? It is very hard to tell the difference, as it all becomes ambiguous, paradoxical, very mixed. Where do you go from here? No easy answers anywhere. Perhaps the only thing to do is to acknowledge and move with this radical opening and to put no interpretations on it, assuming nothing at all. For if you can welcome multidimensionality with truly open arms, it might well turn out that the future was never supposed to be like the past. And that becoming so free does provide an open access channel for what needs to happen - to come through a jump ahead of the last moment, synchronized with evolution beautifully. AQUARIUS 14 Degree - In a pyramid a dark passageway filled with scorpions. Coming to a point in the journey where everything you fear, all that you wish to avoid, inevitably happens. Your mind’s blind spots call up remedial action. Karmic lessons take over. A probationary path of self-testings and self-torments, Never letting yourself off easy. Determined almost blindly to expose yourself to the worst, you are particularly drawn to work out collective blind spots and missing pieces. Even willing to take them on, to play them through. Preferring to be the villain or the gadfly or the devil’s advocate to letting well-enough alone. You feel irresistibly compelled in both self and world to draw everything up to the surface, to bring it all out - to make it visible and tangible. You have the excessive and redemptive eye for the dark side that must be cleared for free passage to become possible ever again. AQUARIUS 15 Degree - A jade burial suit. You feel propelled into a self-consistent, thematic existence with a characteristic flair or touch, stuck with being a certain way and following this out to the end. The mind is logical, rational, and linear. The life is the same. Yet what happens to you along the way is that so many pasts and so many futures wander through that the basic karmic pattern of holding true to a fixed nature is counterpointed by intimations, overtones, and undertones of everything but that. You cleave tightly to a purposive track, while almost flooded with alternatives and diversions. A rocklike nature. Ego-driven. Mentally compulsive yet peripherally open to the wildest array of worlds, you are someone who cannot stop doing and saying the same things in the same ways, and it can go on for just about forever. Yet inside of that, you have virtues and gifts galore, held for the indefinite future cautiously, prudently, and discouragingly. AQUARIUS 16 Degree - Ground up gem stones to be used as medicine. Technical proficiency across a broad spectrum of forms and ways. Knowing how to do just about anything, you are involved with the precise combinations in a dazzling display of capacity. You seek to find new ways, innovations, and fresh approaches, yet you are steeped in tradition and ancient wisdom. Somewhat swept away with the whole enterprise, where the mere linear intelligence takes charge and views everything on its terms. Intent upon results, looking for proof, insistent that the objective, factual, practical realities are everything. You feel compelled by your vantage point to apply a fierce ideology to every manifest particular. Seeing examples, variations, confirmations, and validations of the theory, the principle, the standpoint. Driving home verbally, brilliantly, the argument. Caught in the dialectics of truth and falsehood. And comprehensively enclosed within a one-sided and self-justifying thrust of mind that is so good at playing this game that you will win and prevail. Yet, something is missing; much is denied. AQUARIUS 17 Degree - An old woman drying herbs. Knowing what you know, being who you are and going where you go, with absolute autonomy. A complete world unto yourself. Living out away from the unwelcome intrusion of alien perspectives. Ornery, taciturn, eccentric. Convinced that your own truth-consciousness is the real thing and that very few others know what they are talking about. Steeped in experience of a solitary kind. A highly distinctive mode of awareness. You seek to link ancient wisdom with future worlds, absolutely intent upon losing nothing in the translation. Rabidly convinced you must not concede unnecessary territory to the common mind of today. Acutely well-informed and voluminously knowledgeable. Working for the future Earth, you are supremely intolerant of compromises and latter-day confusions. AQUARIUS 18 Degree - An American Indian woman in a canoe. She is gathering wild rice. A free spirit comes in surprising packages. Navigational sophistication veiled by the simple ways of life. Inside the soul, a rich complexity, an astounding grasp of what is happening and what it means, lives on undisturbed. Outwardly, you greatly prefer and gravitate toward any form that will throw everybody off and leave you in peace. The story lies inside. Many times and places, many dimensions and worlds are set loose to be simultaneously worked out, played out, encompassed, and freed up. A dazzling virtuoso performance inside the soul of letting go of everything. Yet outwardly a stiff upper lip composing the appearances. So that you can be blameless and impeccable, and even keep your own conscious mind entertained and confused long enough to get away with radical evolutionary moves, into the vast unknown, never to look back. AQUARIUS 19 Degree - Loud crushing noises as a glacier moves. The indomitable spirit of one who has been at this forever and will still be on collective karmic alert to the very end. Purpose hugely takes precedence. Whatever is changing and whatever is staying the same are the two forces you track with and report back to cosmic center upon. You are being driven to the utmost to observe and witness objectively and dispassionately all the decisive and epochal shifts and pressures in the collective mix. Eyes wide open in the dark. Attention riveted to trends and turning points, and yielded up to a long-ago-agreed-to code of recording and evaluating all the relevant data; so that the cosmic forces can determine what is happening way down here and can fine-tune their ways to evolve the situation optimally; so that all concerned can synchronize with the greater ways and be released from anything and everything that runs counter to the bright promise of Earth evolution. AQUARIUS 20 Degree - A fine silk thread strung across a chasm. Inward intention counts for everything. Outward results do not matter. You are dropped into remote places to be a subtle glue, a connecting intelligence just along the inside. Upon the outside, nothing happens. A tenuous sensibility stays tuned to subtle frequencies with celestial dispassion. You are remarkably absent from the daily rough and tumble of what seems to go on around you. Inexplicably and improbably, you indwell an otherness, an alienness that consciously has no idea what it is doing. But when you are around, other people find that there are blessings, breakthroughs, protections, and odd phenomena, adding up to the impression that one is touched by something marvelous and strange. Being an empty open vessel for the cosmic and inhabiting foreground consciousness not at all. Just being there. Nothing else is asked. AQUARIUS 21 Degree - A beautiful woman dressed in white. She is wearing a large silver crescent on her head. The crescent is pointing upward. The transcendent and the fragrant particulars of life feed into each other and complete each other if you are radiantly responsive to their comminglings. In the dance of time, there comes a fresh cycle where the high feminine spirit comes into her own. She is Queen of the Heavens, yet she belongs in the Earth. And as she comes to herself she brings the worlds together, repolarizes and articulates the power of love. She is the caller, inaugurating the future. Yet early on she stumbles and falls, for what she is carrying is immense and it is too much for her personally. She must discover how to find a true form to harness, discipline, and distribute what she knows and who she is. As she gets her greater bearings and embraces multidimensional selfhood, she shall indeed find that destiny situates her right where she needs to be. And that becoming a collective fount of real-life inspiration is her very nature, her path, and her complete liberation from the misunderstandings and fragmentations of the days when she just could not get out of the way with sufficient grace and authentic conviction. AQUARIUS 22 Degree - A woman making lace. Withheld from the personality spotlight. To you intrinsic, fine things matter exquisitely and being somebody does not. A highly distinctive form of service keyed to a slow, steady, inward sensibility. Very little connection with the here and now. Eternal foundations. Needing to be humble, sober, and plain in order best to be transparent and effective, you are remarkably detached from your own reputation or outward impression. Dreaming new worlds into being. Cast loose on an infinite sea. Yet being circumspect, quiet, and not particularly noticeable. A super subtle edge between poverty and riches, surface and depth. Knowing your way in the dark. And intent upon completing each task and carrying it through; nothing more, nothing less. AQUARIUS 23 Degree - Ancient runes carved at random on gray rocks. Learning ultimate things the hard way. You have to put yourself totally into every realm to experience it for yourself, with a zeal for empirical wisdom or the wild edge of the scientific method. The experimental test case is yourself. And you are out there all alone in vast, uncharted territory, just the way you like it. You’ve been granted the chance to prove things, to follow them out quite far, bearing a determined intelligence with karmically-trained faculties of subtle perception. However, objectively speaking, this is an intensively arduous and relentless way to do it, without safeguards or precedents, relying upon the moment’s edge. If you can be tirelessly strong, doing it this ruggedly will prove to be the only way to go if you wish to uncover future territory without imprinting bias or distortion upon it. You just have to invent the wheel in yet another dimension. AQUARIUS 24 Degree - A large brown bear picking and eating apples. Gross indulgence and a conscience that just won’t quit. Saturating your energy field with exaggerated gestures of capitulation to your own lower nature. But you do this in continual ironic juxtaposition to an observing intelligence and a keen conscience which deplore and have no use for your own shenanigans. Being split between the compulsive and addictive personality and the dispassionate and icily-removed consciousness. You’re trying to turn yourself around by alternately bingeing and reforming. But each binge triggers a reaction of the other side of mind, and each renunciation and reformation in turns triggers a further reaction. This dialectic between being bad and being good is all on the pro and con level of the dualistic mind. The only hope in this pattern lies in wearing out both ends, so that a third place can open in which neither acting out nor becoming exemplary is all that necessary. You do what you do and you see it the way you see it and all the self-conscious overlays and each and every self-manipulation in whatever direction dissolve when the space is clear. AQUARIUS 25 Degree - A moustache. Disciplined, constrained, and consistent. Keeping things within the boundaries set by rational cognition, doing what is strictly appropriate. Objectively, impersonally, dispassionately deciding and choosing and following this up with a way of life. Circumspect, intensely aware of reputation and community standing. You live up to the highest standards impeccably and are self-suppressive routinely. Everything has been decided ahead of time. Obedience to the greater instructions. Subordinated to what shall serve and what shall reach far and wide. Able to tailor and custom-fit your behavior and expression so that the greater good is served absolutely, you manifest pure adherence to the law, with no qualms, no quibbles, no questions. AQUARIUS 26 Degree - Dragonflies around a stagnant pool. Vicarious experience. Living through others. Collecting data. Knowing what everybody thinks, you put your attention rabidly outside yourself into the collective and its traps and pitfalls. Circulating in the thick of collective karmas. You are cynically fascinated by what is wrong, what is miserable, what is rotten - gathering lessons from the worst. Somewhat taken over by the downward tug of wastage, decadence, the ends of things. Witty and stimulating, provocative and penetrating. But cut off from spirit, you wander in the maze of the cultural intellect, trying to find meaning where there is mostly nothingness. AQUARIUS 27 Degree - A man laying stones for a path. If vision and practical skills are brought into a place beyond either one, new worlds can come into being. Tenacity is the key. You have to see the pattern, inscribe the pattern, and let it set collectively. For when you are out ahead of everybody else, you must master the craft of timing in this Earth. Everything is perfect in the right time and place and awful when out of sync. Contained within yourself is the blueprint for the future; you need to season and temper the extraordinary forefront awareness with life-experience, and discover the intricacies of the cultural landscape. A mission pursued, a task taken on with a vengeance. A destiny that stands out and speaks volumes. AQUARIUS 28 Degree - A tapestry loom. On it is a half-finished tapestry. Karmic process restricts the self, curbs the self, dictates what must happen to the self. A work upon yourself and, far more strongly, an outer plane self-discipline has been in progress a long time. It must be resumed, taken further, no matter what. Unfortunately, this often means imposing duties upon yourself presumptively. You just do what you have to do. But if the heart is not in it, work becomes mechanical. A dilemma faces you at recurrent cross-roads: to stay with what has been set up, or to introduce innovations. Any such innovations represent a huge issue. But without them, the inner core of self is short-changed and the outer mind takes over. You are being propelled by a greater destiny-current to honor all karmic agreements, and to enhance these by bringing into play a vitally engaged present-time attentive willingness to be surprised, meet things from another side, and realize that everything is just beginning now and needs to be met with real passion. AQUARIUS 29 Degree - The sound of dripping water echoes through a great stone room. The most unusual and distinctive of inward conditions. You are held within a mode of awareness that is from another time and place altogether. You have nothing to say and nothing to do. There is no power of individual life-force. Instead you see as the ancient ones see. Utter unworldliness to a point of dissociation from surface experience. A part of the mind transported by a reverie of timeless, effortless realization. Everything is clear. The subtlest, most refined things are obvious. It is all a matter of perspective, and here the perspective is that the only thing that matters is how the inward resonant echo registers and where it leads you in choiceless awareness, in communion with the Gods. AQUARIUS 30 Degree - A large pool filled with white water lilies in bloom. Integration and synthesis. Putting it all together. Creative intelligence at its best. Having gone on ahead and seen what can be, yet suspending your vision so that freedom and open-endedness are honored. Living on many planes at once, in intricate refinement. You have the ability to hold in place as many independent variables as become relevant, an especially distinctive quality of unqualified or unconditional regard and respect for one and all. Universal brotherhood and sisterhood as the impulse of the future, active now.